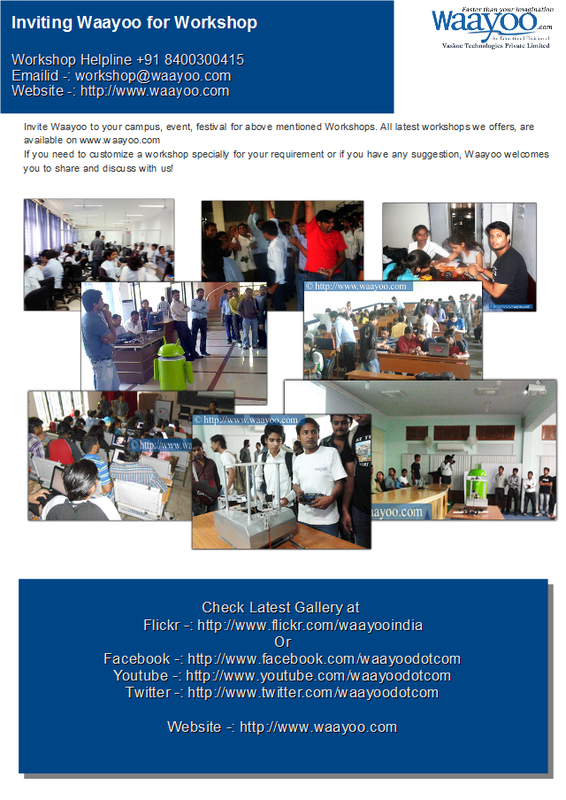 Since 2011, Waayoo has conducted several workshops in engineering colleges in India. Now Waayoo is offering onsite workshops for school students too. 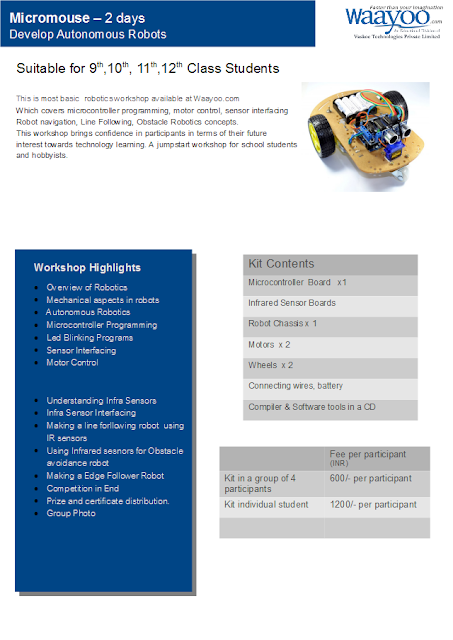 We have designed some workshops which will help students to understand basics of robotics, how robot work? how they think? What is Logic? What is programming? every thing is covered in these workshops. 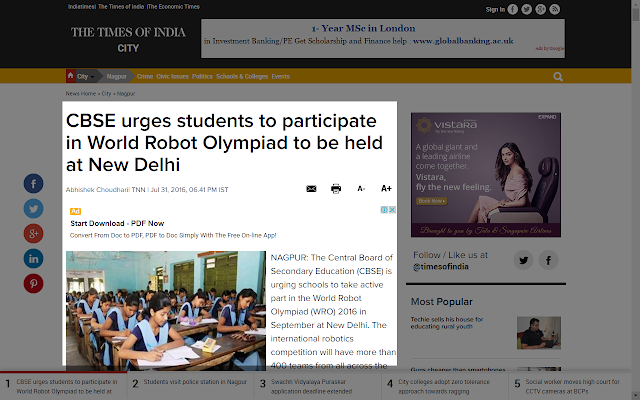 From this news we can understand that schools are also focusing on Robotics education in India now. But how do they start? We have a solution for you. We have come up with some levels of robotics workshops. Arduino based Programmable Robotics workshops for students of class 9th to 12th. Throughout the year Waayoo’s development team is busy in the development of some innovative products for market. Same expert team is also involved in introducing some of the great training and workshop programs in Waayoo’s offering. This year 2016 Waayoo has included several innovative workshops including VisionRobotics with OpenCV RaspberryPi, CNC, 3D Printer, Ornithopter Bird, Spherical Drone workshops and much more. We love to spread these knowledge to our younger ones and juniors. Summer holidays are back. So what are you planning next? 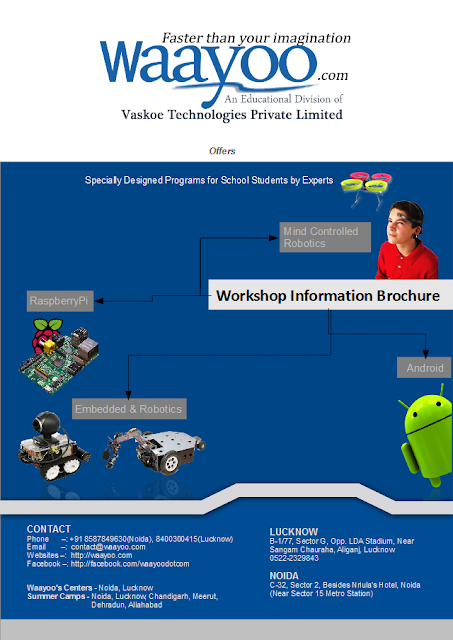 This year Waayoo is offering summer training programs in Robotics, Embedded System and Drones. Waayoo is always committed to offer you latest and advanced topics for learning as compare to old and boring topics provided by most of them out there. 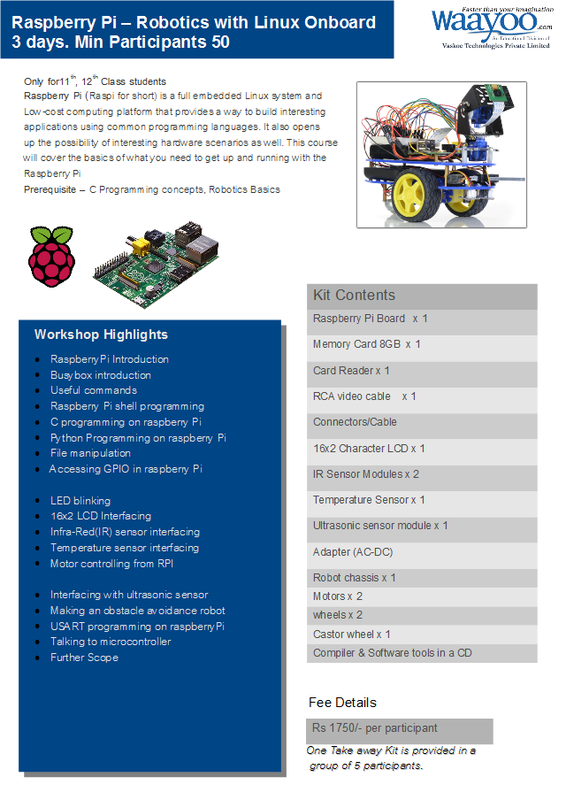 If you are new in learning these technologies, we recommend you to start from iRobotics training program or make a package of advance training module with iRobotics. Registration process has been started. Seats are limited, so we recommend you to book your seat at the earliest. Prototype of TAS hexapod robot has been tested with features like moving forward, turning left and right, moving backward, twisting body etc. We are now producing attractive educational kits of TAS hexapod robot and it will be available soon by our partner sellers. Yes poorly arranged wires. It’s a prototype.